If you have no working knowledge of a garage door, then you may not know that springs are an integral component of a garage door and is responsible for its smooth functioning. It is these springs that allow the garage doors to go up and down. Since the weight of these heavy doors rest on these components, they are likely to break or wear-out over a period of time. When we ignore these broken springs, we are not putting ourselves to risk but also the safety of our property. This is why you need experts like Expert Garage Doors Service who can keep a check on your garage door springs and ensure its timely upkeep involving replacement, repair or tightening the springs. Any technician who calls himself a garage door expert must have not just knowledge but also skill and expertise when it comes to springs. Since they play a major role in a door’s functioning, they must be picked carefully, based on their size, door’s weight and other such requirements. If chosen incorrectly, the garage doors may have serious consequences in the future. This is why we recommend that you only choose Expert Garage Doors Service as your garage door expert. We have been helping our customers in Griffith, IN with not just repairs and maintenance but also the installation of door springs when required. Our ten years of experience in Griffith has taught us that our customers want quality over anything else. But we give a lot more than that! Expert Garage Doors Service gives you round the clock quality garage door service at reasonable prices. Back in the day, extension springs were commonly used as an integral component of garage doors. However, in today’s age, it is better to rely on torsion springs because of their exceptional mechanism. The torsion spring system has been designed in such a way that when door is lifted, the weight is transferred to its cables that are connected to the drums at both ends, tightly wound by spring over a shaft. As a result, the door has lesser cases of a broken spring and can hold the door more firmly. 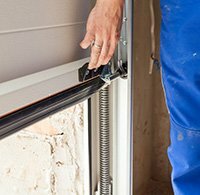 Since torsion springs can only be installed or repaired by someone who has experience with these springs, we recommend you to call Expert Garage Doors Service if you require spring related services. We have the expertise to pick the right kind of spring for your door and can also install it for you with ease. Extension springs are relatively cheaper than torsion springs and work on the expansion/contraction principle. When the door closes, the spring comes back to its expanded position and contracts when the door opens. Since these springs store high amounts of energy, they should not be tackled by any one who doesn’t have the experience. Mishandling of these springs can cause the spring to snap and cause serious injury to the individual. For its timely repair and maintenance, call Expert Garage Doors Service. We have the experience to handle these springs and doors and offer complete garage door solutions at your doorstep.